spot, and a rich biological resource. 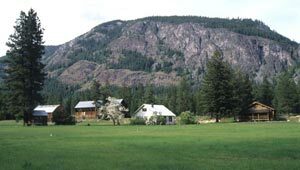 The 1200-acre Early Winters Property—also known as Arrowleaf—borders the Methow River and hosts major sections of the popular 100-mile Methow Valley cross-country ski network. Development had threatened the property for 30 years, the last in the form of Arrowleaf, a proposed 560-home resort and golf course. After repeated protection plans failed, TPL stepped in to acquire Arrowleaf in 2000. In an innovative approach, we divided the property into five parcels for sale to conservation-minded buyers. A conservation easement restricts development on each property to one, three-acre home site, with the remainder preserved for wildlife and low impact recreation. The project was completed in 2004 and the Washington Department of Fish and Wildlife is the principal steward of the conservation easements.